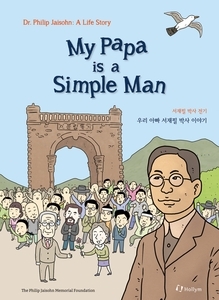 The story, geared towards young readers age 9-15, has a theme of love of country and love of family in the late 19th century and in the early 20th as young readers follow the life�s journey of Philip Jaisohn who loved Korean nation as a liberal democrat. Beginning with the story that Dr. Philip told her daughter Muriel his life journey, the cartoon book explores all facets of Philip�s life such as a father, a journalist, a founder of the first Korean newspaper in Hangul, the Independent News, a fighter for Korea�s independence, first naturalized American citizen of Korean descent, first Korean American medical doctor, and a reformer for Korea�s democratization, and so on. People own the country. How can you have a nation without its people? I�ve lived with only one mission in life: democracy. I love my motherland and my family. That�s all. I am a simple man.